ANOTHER key member of Hawthorn's premiership dynasty has been poached, with elite performance manager Andrew Russell set to depart for Carlton. Star wingman and vice-captain Isaac Smith let the news slip that Russell was departing during his third-place speech at the club's Peter Crimmins Medal function on Saturday night. Russell's standing at the club was evidenced by the gasp from guests in the Crown Palladium at Smith's shock announcement. AFL.com.au understands he is still under contract and the Hawks are in negotiations with the Blues about releasing him to Ikon Park. Carlton, which is coached by former Alastair Clarkson disciple Brendon Bolton, conducted a thorough review of its fitness and conditioning program and advertised for a high-performance manager. Russell isn't the first Hawthorn staffer Bolton has lured to his new club, with psychologist Anthony Klarica, who heads up elite performance and leadership, among his recruits after joining the Blues in 2015. He was Port Adelaide's fitness boss and worked at Essendon before that, and he is a man in demand, but had resisted rival clubs' overtures until now. Hawks coach Clarkson, who has re-signed until 2022, recruited Russell from the Power to his team in 2005 and he has been at Waverley Park ever since. Russell is credited with solving a number of Hawthorn stars' injury problems across the years, including Shaun Burgoyne, Luke Hodge, Brian Lake, Ryan Burton and most recently Jaeger O'Meara's troublesome knee. 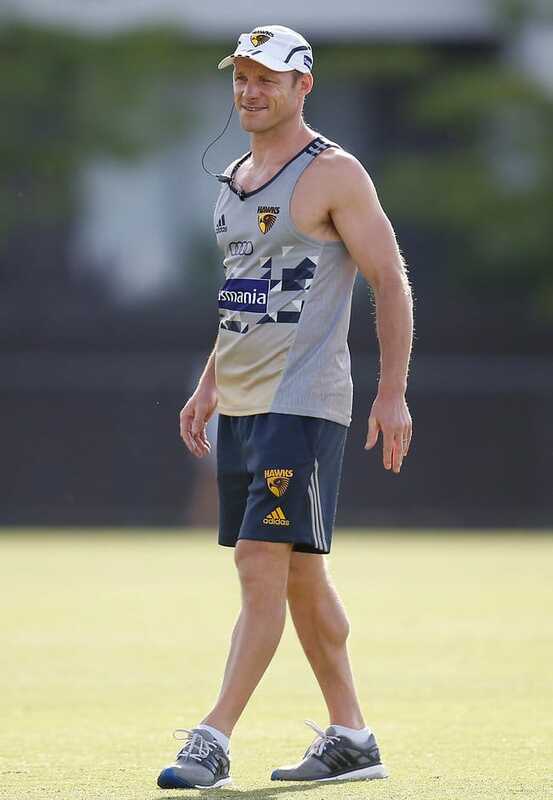 "Yes, doctors have a big impact, but just behind, or even equal to the importance of Clarko, is Andrew Russell," Lake told AFL.com.au in June. "Patience and authority is something you don't get (elsewhere) with heads of fitness, because of pressure from the senior coach, but not with Andrew Russell. "Clarko respects him and has great confidence in him. It's the player first with him, and getting him to a point where he is ready to compete at AFL level, like Jaeger. "Older players, players with previous injuries had training sessions tailored for their own needs. Logistically, it's hard to monitor everyone in every session, so ownership for some players is crucial. "He's a hard arse, Andrew Russell, but he gets results and that's how he gains so much respect." Brownlow medallist Tom Mitchell, who won his second straight Peter Crimmins Medal on the night, praised Russell's impact on the playing group. "The players love him, not only for the knowledge he passes on, but the relationship he has with you," Mitchell told AFL.com.au. "He genuinely cares about all the players and wants to get the best out of everyone and wants to see everyone improve, so he's a great asset."